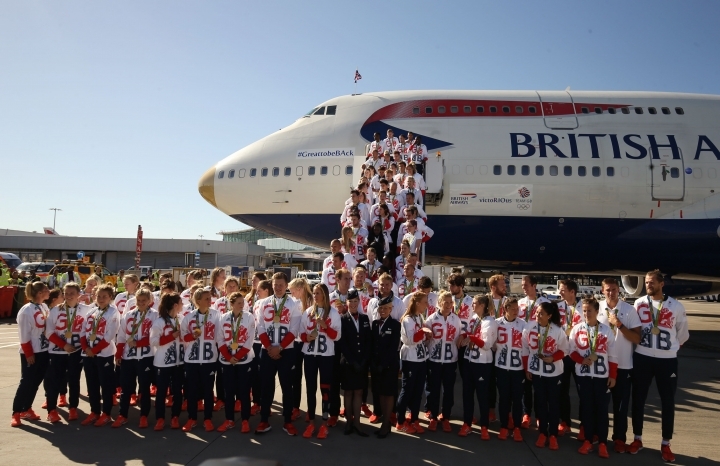 LONDON — Arriving in a plane with a gold-painted nose cone and "victoRIOus" emblazoned on the livery, Britain's Olympic team returned home Tuesday to jubilant scenes after the country's record-breaking medal haul in Brazil. Max Whitlock and Nicola Adams, who won three of Britain's 27 gold medals in Rio de Janeiro, were the first Olympians to emerge from the plane at London's Heathrow Airport and stood at the top of the stairs as the rest of the team filed out to cheers and applause. Children crouched in front of the barriers clutching small British flags, and friends, family and well-wishers — adorned with union flags and red, white and blue balloons — welcomed home the 320-strong team of athletes and support staff. Britain won 67 medals to finish second in the gold medal table, behind the United States, and became the first country to improve on a home medal haul at the next games, having collected 65 at the 2012 Olympics in London. More than 35 percent of Britain's team in Rio won a medal. Rower Katherine Grainger, who won silver to pick up a medal at a fifth straight Olympics, said the success of Britain's team had lifted a nation splintered by Britain's divisive vote in June to leave the European Union. "It has almost felt like it has been a tough year for the country, a lot has happened politically in the nation in the last few months," Grainger said. "I think the nice thing about sport is it does unite people and it lifts people. So, yeah, I think ... the timing means that it is one of the best Olympics, the best sporting events we probably ever had." Posts on social media by team members revealed athletes' fun on the flight from Rio to London, which had 77 bottles of champagne on board. Whitlock, a double gold-medalist, tried out some of his gymnastics routine on the first-class seats, and the team belted out a rendition of national anthem "God Save The Queen" before the flight left.